New numbers show that the 7,499 ‘highly compensated,’ six-figure school administrator/teacher retirees cost IL taxpayers nearly $1 billion per year. But in just six years, the problem of six-figure pensions will be three-times worse. In 2014 I wrote in Forbes about a pair of union lobbyists who substitute taught for one-day in the public schools and then started collecting over $1 million of lifetime public ‘teacher’ pension payout – despite a state law expressly designed to stop them. Now, after recent Illinois Supreme Court decisions confirming that pension benefits are constitutionally guaranteed (including the pensions for the pair of union lobbyists above), the public employee gravy train is running faster than ever. 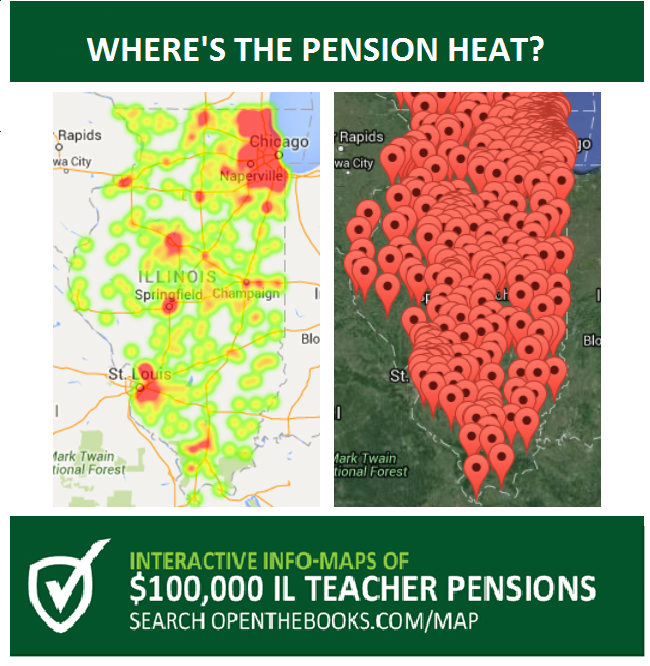 This week, our organization at OpenTheBooks.com debuted our interactive info mapping platform giving context to the 7,499 retired Illinois educators who pulled-down a pension of $100,000 or more. These retirees cost Illinois taxpayers $900 million (2015). Individually, these pension millionaires contributed so little to the system that they ‘broke-even’ on their ‘cost-basis’ within the first 20-months of retirement. It takes the equivalent of all income taxes paid by 330,177 individual Illinois taxpayers to fund the nearly $1 billion for the 7,499 ‘highly compensated’ six-figure retirees. By any estimation, this is unsustainable. Illinois only has 6.2 million people with jobs. By 2017, Illinois income taxpayers will be on the hook for more than 10,000 educator pensions paying more than $100,000. The number of six-figure pensions increased by 57 percent in just the past two years – from 4,767 2013 to 5,930 in 2014. But, it quickly gets much worse. Our data and analysis at OpenTheBooks.com shows that by 2022, over 20,000 Illinois teachers/administrators will have pensions exceeding $100,000 annually. Locally, school districts are spiking salaries – granting raises near the end of a career to raise guaranteed pensions – which drives costs even higher. Taxpayers are fighting back in creative ways (read my Forbes piece on the ‘Shouse/ Tiny house’ movement in Illinois) but systemic abuse persists. The Top 100 All-Time pensions: #1 $302,991 (Lawrence Wyllie at Lincoln-Way CHSD) to #100 $200,812 (Michael Radakovic at Aurora East USD 131). Read the Top 500 All-Time IL teacher pension list. The Top 5 school districts conferring six-figure pensions are Palatine TWP HSD 211, Palatine (449); Township HSD 214, Arlington Heights (419); Consolidated HSD 230, Orland Park (196); Northfield TWP HSD 225, Glenview (188); Maine TWP HSD 207, Park Ridge (180). Click here to look-up your school district or any district in Illinois using our interactive map. Northern Illinois school districts are driving the majority of $100,000 pensions. In fact, 6,706 pensions for over $800 million in annual payouts were conferred by districts in the Chicago metropolitan suburban area. Only 793 six-figure pensions totaling $95 million in annual payouts were conferred by school districts in the rest of the state.Yet, income-taxpayers across the whole state guarantee the retirement annuities for everyone. The public pension largess is not only for government educators, but also private education associations and union bosses. For example, Reginald Weaver was President of the National Education Association (NEA) in Washington, D.C. – the de facto national teacher’s union. Weaver’s Illinois teacher’s pension is now $22,759 per month, or $273,108 annually. Moreover, many administrators taking six-figure pensions really aren’t even ‘retired.’ Twenty-one highly compensated school administrators are now members of the municipal system, not the teacher’s system. It’s double-dipping: receiving a ‘teacher’ retirement pension, while also rehired by a school under the ‘municipal’ plan. This form of doubling-dipping is not prohibited under Illinois law. It should be. For example, Mohsin Dada made $503,200 by double dipping the Teacher’s Retirement System (TRS) and the Illinois Municipal system (IMRF). Dada’s teacher pension is $254,700 and his current salary from North Shore School District 112 is $248,510 – up from $202,903 just three years ago (2012). Outside of the six-figure pension for the ‘highly compensated’ educators, there are another 100,000 pensions for rank-and-file teachers. By our calculation, $1 of every $3 collected by the Illinois income tax now goes toward these retirement annuities – that’s the equivalent of all income taxes paid by 2 million hard-working Illinoisans each year. Yet, the system looks impenetrable to reform. For example, the Park Ridge – Niles School District 64 (elementary) pays 142 current teachers/administrators six-figure salaries, and 18 are already retired on $100,000 plus pensions. Taxpayers even funded the school’s retirement party at the Park Ridge Country Club complete with herb mustard-crusted filet mignon, special tilapia and high-end chocolate desserts. It’s a never-ending salary and pension party, all on your dime.